Based on our environmental footprint management of, we promote initiatives to minimize the negative impacts on the climate and enhance the positive impacts. Global warming, as a result of increased greenhouse gas (GHG) emissions, is one of the key environmental issues today, according to the United Nations. In the medium and long term, the climate change effects can lead to modifications in water regime and vegetation with consequent impacts on biodiversity. To learn more about climate change, visit the Ibá website. The lands where our forestry operations are located, in the southern Bahia, are part of Atlantic Forest biome, a site of high biodiversity. Operating a forest-based company means giving full attention to the potential impacts on this biome, including changes in the terrestrial and aquatic biotic environments, changes in the landscape, changes in soil and intensification of climate change, among other elements. Therefore, we have monitored these elements to assess impacts and the required mitigating measures in each part within the territory where we operate. Learn more about this and other initiatives for biodiversity preservation and conservation in this chapter. 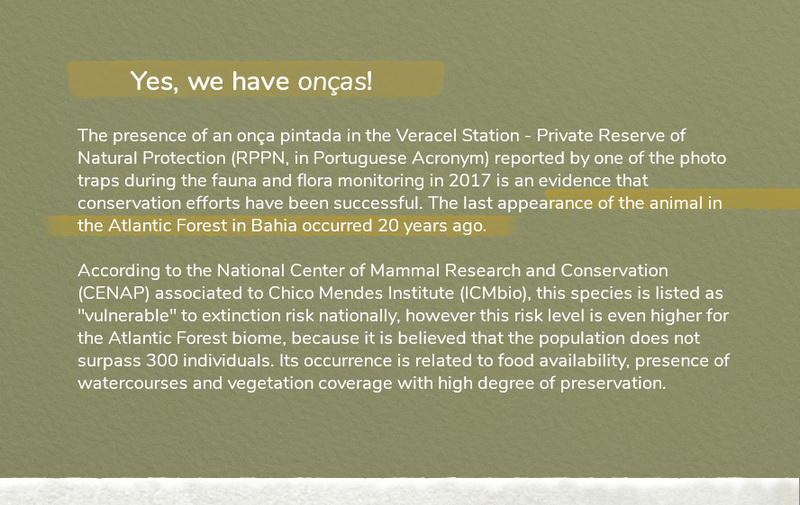 Fábio Faraco, manager at Pau Brasil National Park – ICMbio. Areas classified as Private Reserve of Natural Heritage (RPPN) and Area of High Conservation Value (AAVC, in Portuguese acronym) are considered “Inside”. Areas located three kilometers away from the “inside” areas are considered “Surrounding”. The additional protected areas are those that are preserved as part of the company’s environmental management even if there is no legal obligation (Legal Reserve or Permanent Preservation). 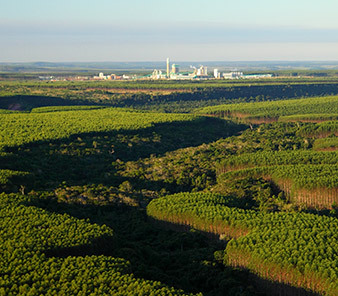 Our practices to promote the biome conservation include the support to develop the Municipal Plans for Conservation and Recovery of the Atlantic Forest (PMMA) of nine of 10 municipalities where the company operates (in 2013, when Veracel undertook this support, Porto Seguro had already started its PMMA). This initiative had an important advance in 2017, when the plans of the 10 municipalities were integrated. Access the Download Center and know the plans. The Plan, a requirement of the Atlantic Forest Law, collects and standardizes elements required for protection, conservation, recovery and sustainable use of the Atlantic Forest developed for each municipality. Our support is given through a collaboration agreement signed with SOS Mata Atlântica foundation, and the development is in charge of Grupo Ambiental da Bahia (Gamba). With the integration, the municipalities can interact with an integrated vision and in territorial scale, avoiding fragmented initiatives in the management of sustainable practices for the biome conservation. 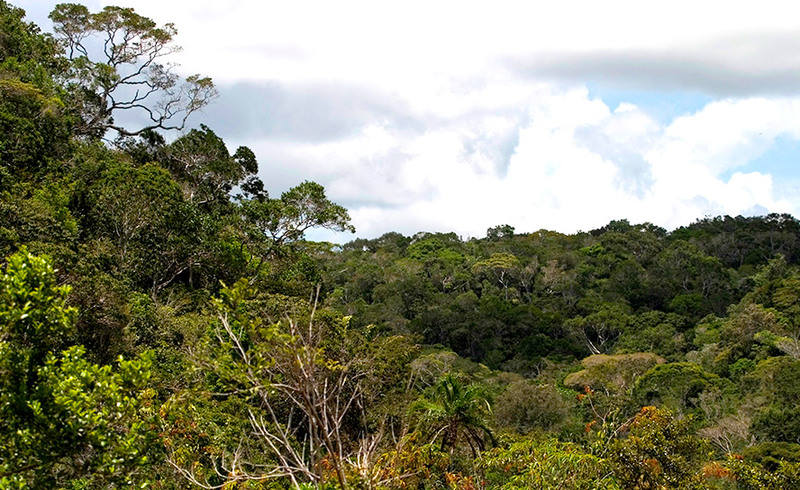 We have maintained the Atlantic Forest Program (PMA) since 1994, aiming to close partnerships to promote the Atlantic Forest’s biodiversity based on our forestry projects, using the mosaic plantation in order to connect fragments of forest native in the region. We are committed to recover a minimum of 400 hectares annually, using effective planting and/or enrichment. As they have environmental or social features of exceptional or critical importance, the areas of High Conservation Value (AAVC) deserve special attention. That is why we maintain a physical protection plan to identify critical and fragile areas and define strategies and actions required for prevention, control and mitigation of threats, pressures and risks that could cause damage both to the High Conservation Value attributes and safety of employee, researchers and visitors. In 2018, we intend to broaden the dialogue with enforcement agencies in order to seek intelligence to curb the hunting and consumption of products from hunting and trafficking of wild animals. *The amount was lower than one reported in the previous year (871), because we concluded with the enhanced checking each year that two species treated as independent are, in fact, a single species. By keeping close tabs on the potential impacts of barge operations in the Belmonte Maritime Terminal (TMB, in Portuguese acronym), from where we ship about of 1.1 million tons of cellulose, we conduct aerial and on-board monitoring of cetaceans and monitoring of turtles over 34 km of beaches North and South of the terminal. 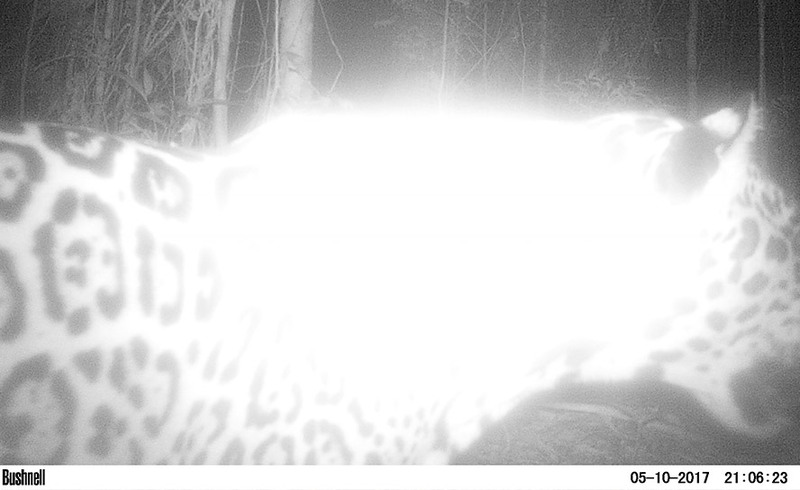 During these activities, we monitor aspects such as obstacles, population density and breeding conditions. The monitoring complies with requirements for operations in the terminal. In the last 2016-2017monitoring season, 448 evidences of turtle reproductive activities were reported in the range of 34 kilometers of beach stretch around the TMB. It is one of the highest levels in this category, overcoming the historical average of 344. This work is developed in partnership with CTA Meio Ambiente. Há alguns anos, a operação do Terminal Marítimo de Belmonte (TMB) começou a ser impactada com o assoreamento do canal de navegação das barcaças. O assoreamento é um processo natural em que a própria movimentação da água acumula sedimentos no fundo do canal, tornando o canal mais raso, dificultando o acesso das barcaças ao píer. Para manter a profundidade do canal, foi implantado, em março de 2017 o sistema sand by pass. Esse sistema de transpasse de areia funciona como uma dragagem contínua que impede que a areia se acumule no berço de atracação, evitando a restrição de navegação e capacidade das barcaças. Trata-se de uma solução inovadora, eficiente e ambientalmente correta, licenciada pelo órgão ambiental da Bahia. Veracel has been part of the New Generation Plantations Platform (NGP), an initiative coordinated by the World Wilde Fund (WWF) since 2016. It is a work that brings together companies, civil society organizations and the public sector to share knowledge about best planting practices. This great forum seeks an ideal form of plantations that maintains the ecosystem integrity, protect and promote high conservation values through effective processes for stakeholder engagement. Learn more on the NGP website. Water and soil monitoring: we do it! Based on the Sustainable Forest Management principle, we periodically monitor the impacts of our forest operations in the eucalyptus plantation areas, through the annual monitoring of water, soil and micro-catchment quality. Potential impacts include conflicts over water use, micro-catchment health, downstream impacts and soil productive potential. The soil and water monitoring is done in 10 points under direct and/or exclusive influence of eucalyptus, of which five are in the company’s properties and five in lands of producers included in the Produtor Florestal program. Until 2017,the results showed that the river water quality had met the Conama’s requirements (Conama Resolution 357, of March 17, 2005, Class II) for human consumption (after treatment) and irrigation, recreation, aquaculture and fishing activities. In the micro-catchments, the monitoring is continuous and simultaneous in four hydrographic points within Veracel’s areas, using comparative indicator methods: water balance, stream hydro-chemistry, losses of soil and nutrients. The work is done in partnership with the Micro-catchment Monitoring Program (Promab), coordinated by the Institute of Research and Studies (Ipef) at the University of São Paulo (USP). During the micro-catchment monitoring, no evidence of water contamination was found, which indicates that there are no effects of use neither on the groundwater table level nor on groundwater quality.